It was back in time when to rank high in search results you need to invest time in keyword stuffing and link building efforts. Keyword research is the base starting point for online marketing. This affects everything from navigation to site content to web designing. But the recent boom in Google’s update has made it laborious task to beat the competition and appear on the first page in the search results. With more and more ranking factors contributing to where your website will appear in search results, the fact is that UX plays an important role in your ranking status. As Google advances its ranking factor strategies, keeping the focus on how to get mass to your websites through search results and how users feel is going to be momentous than ever. bounce rate while SEO targets search engines ranking the website high or low affecting the search results. User experience is different than usability. User Experience: It is the showcase of design in shaping a user’s experience while on your website. It’s the user’s engagement in respect to its subjective feelings while surfing on your website including whether they feel your site is user-friendly with an easy to use, engaging and valuable. Usability: It depends on the technical effectiveness of your website in terms of its functionality, error-free and how easy user can learn the flow of the website. It mainly includes a user’s interaction with the website and searches for the relevance of content in accordance with their needs. The key difference is that user experience main focus is user perception in terms of site interaction and usability is the ease of usage. User experience targets site visitors and bounce rate of the website in regards to landing on the site and user interaction with the website. To summarize it what’s’ good for the user is good for the web crawlers resulting in higher ranks in search engines. Google’s search algorithm emphasizes on website designing for User Experience rather than website designing merely for SEO purposes. In today’s era, the majority of the people use mobile devices to access the internet and keeping this accordance in mind Google released a mobile-friendly update in April 2015. In order to increase your website rankings, websites need to adhere to UX design in terms of making the websites mobile friendly and legible and functional on devices like phones and tablets. Mobile friendliness is not only a major factor in consideration to Google ranking but Google has actually created a mobile algorithm to help rank websites in lieu of mobile search results. Mobile – friendly: If a website passes Google mobile-friendly test then in terms of SEO the website is considered to be mobile friendly. Responsiveness: A type of website development that enables websites to be mobile friendly by responding to the users’ device is known to be a responsive design. In accordance with the Google mobile-friendly update, preferential treatment would be given to websites that are responsive or mobile friendly. This update applies not only on the entire website but to individual pages as well. A lot of websites pass Google’s Mobile Friendly tool but fail on individual pages. Google Search Console (formerly Google Webmaster Tools) shows you exactly what pages are broken, and how to fix them. Defining sections in a clear format will help the visitors with ease of navigation and make your one-page site more legible to search spiders and visitors alike. In this case, CSS is defined for users focusing more on the UX. Ensuring great experience through UX by optimizing visuals and content through minimalistic page load time helps Google to rank your site in a better-optimized way decreasing the bounce rate of the site. To test the existing speed of your website on your desktop as well as phone, check out free atGoogle PageSpeed Insights tool and GTmetrix. This tool empowers in decision making in regards to increase performance for your website. It provides recommendations for improving PageSpeed based on current industry practices for both desktop and mobile web performance. Images are one of the top factors in UX and SEO. Appropriate alt text in images with descriptive file names in context to text is noted in terms of the rank factor. Balancing the text and images will be sorted both for UX and SEO departments. Sitemaps are used for search engine crawlers letting the crawlers follow the links to all the individual WebPages basically ensuring the internal linking in the website. They are another excelling way of improving your SEO as it helps users in finding the content. This fulfills the purpose of the sitemap as it makes sure that the search engines crawl all the stuff that they require to crawl from the website. This makes the website easy to crawl, index, and scan and navigate. This creates logical hierarchy and making things organize with ease of navigation and search. Headings are also considered as the roadmap to guide the site visitors’ through your content. As headings make it convenient for both search engine crawlers and site visitors what your content is all about. • Confusing, multi-level and complex menu items should be avoided. • Consider making menu sticky on the top header in case of the desktop site so that it follows site visitors as they scroll through the website. • Keyword research is the base of online marketing so add a search bar so that users can search the content and keyword for what they’re looking for on your site. The basic designing of a website is between SEO and UX as a website begins with structure and ends with the content and it’s designing. 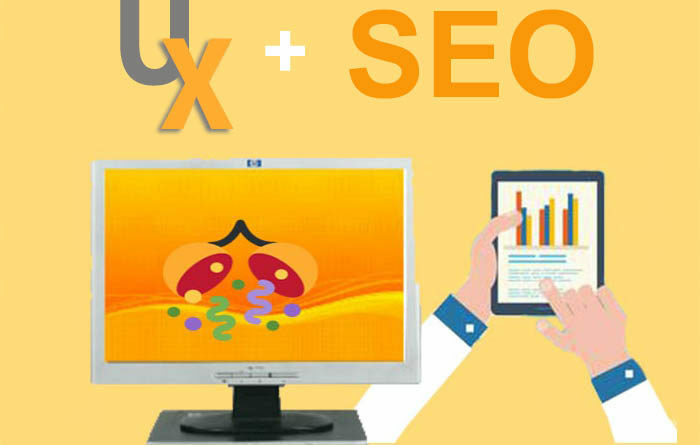 The blend in UX and SEO is important keeping in mind designing the website for the users as well as for the search-bot. Written by Sandeep Mehta passionate website designer in Delhi, the above article briefly displays his profound skills and experiences acquired throughout his journey in the said niche. His passion for helping people in all aspects of website designing and his belief in fulfilling clients’ expectations through mutual beneficially manner has helped their businesses to reach new echelons. ← Why Flutter is above all Mobile App Development Platforms?